New Lodge Project Who's Who. Alternative Names for the St. Albans NEWBODGE. PoolTooSmall Has No Political Status. The existing main pool is 33 metres by 6 lanes. The new main pool is shorter, at 25 metres, and wider at 8 lanes (adding space for an extra 9 bathers). See our handy visual guide to water space changes. It is with great sadness that I must relay the news that David Gilroy passed away in February 2015 following a short illness. 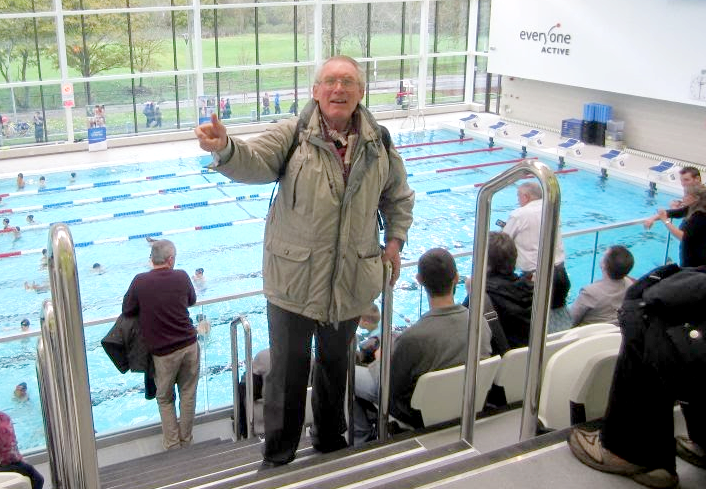 Anyone who knew Dave will know how much effort and enthusiasm he devoted to the fight for securing the best possible new pool for St. Albans, and his dedicated work subsequently with SLM on a range of issues including, of course, enabling diving. Anyone who knew Dave will also know he was very much one of a kind. He could be charming, tenacious – far cleverer and insightful than he appeared – with a healthy disrespect for authority and a revolutionary’s instinct for trouble making, and though he could at times seem utterly exasperating in his unwillingness to give up or back down – as anyone who gets things done must - in truth I think he often knew when to lose a battle to win a war. Above all else David was kind, cheerful, honourable and tremendously generous – generous with his time for the cause of others and generous in his praise for anyone he felt deserved it – his adversaries included. The world needs people like David to get us to change things for the better - to stop us falling back on the same-old same-old – and to do these things with a wink and a cheesy grin. RIP David - you will be greatly missed.